Care Packages for Soldiers: U.S. Soldiers in Iraq are Happy to get Care Packages! U.S. 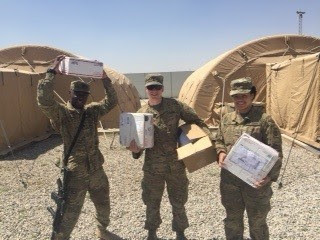 Soldiers in Iraq are Happy to get Care Packages! Here is a note and a couple of pictures from a chaplain Iraq - this unit was one of the 12 units that was part of the packing party held on June 3rd. "Thank you to you and your organization for your continued support. 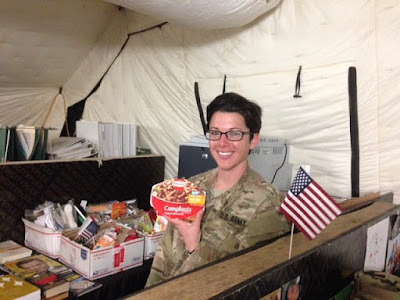 I am attaching a few pictures of Soldiers with care packages for you." The care packages brought smiles to the faces of U.S. Soldiers in Iraq. "... roughly 1300 Soldiers, Sailors, Airmen, and Marines enter our office weekly. We are in need of full size Personal Hygiene items ie. shampoo, body wash, deodorant, toothpaste, tooth brushes, etc. Also very popular is beef jerky, various nuts, gum, and energy drinks".